Taking their name from the Hudson River sloops that repelled the British warships before the Battle of Brooklyn – using fire and water to fight darkness with light – Brooklyn-based Fireships makes guitar-driven alt-folk that’s dreamy and fiery, spontaneous and well-crafted. As the band’s upcoming self-titled debut album covers ground, you’re hearing the journey the band can make, from a self-contained solo act to a collaborative clique of excellent musicians. 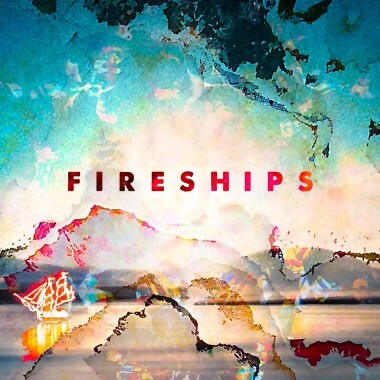 Fireships’ singer-songwriting is classic yet keenly modern, mixing choice folk-rock spanning decades and featuring finger-picked electric guitar of American Folk and West African influence, recalling Lou Reed, Paul Simon’s Graceland, and Deer Tick. Vladeck’s lyrics resonate with the depth and sophistication of the folk tradition; the sound is more contemporary – arrangements billow with bass and strident drums, triumphal organs and harmonies. Multi-instrumentalist Lauren Balthrop’s (Dear Georgiana) Emmylou-esque artistry blends with Andrew’s unvarnished delivery. Rhythm section team Chris Buckridge and Jason Lawrence fuse bass and drums, lending gravitas to songs like drunken astronaut fantasy “Countdown Time.” Dynamic violinist Hannah Thiem, the newest addition to the band, sustains and colors their sound. Fireships recorded in Brooklyn, with producer Paul Loren’s virtuosic contributions and numerous drop-ins by talented friends such as the legendary composer David Amram. “Come Back to Me,” with its playful pennywhistle, chirpy guitar grooves and rollicking drums, contrasts with enchanting quiet moments, as in the haunting ballad “Carried Away,” written with Sydney Wayser (Clara Nova), who also sings on the track. There’s the cheeky candor of “Passing Knowledge of the Sexes,” mostly guitar, percussion and voice. And sometimes they’ll just knock out a rocker like “Going Down Fighting” with Vladeck cranking out some satisfyingly sizzling guitar. Fireships debut album will be released in 2015. Vladeck is also a founding member of The Honey Brothers and Balthrop, Alabama.